When you decide to read a memoir, do you do so to commune with the author–to get to know his inner secrets, what makes him tick? 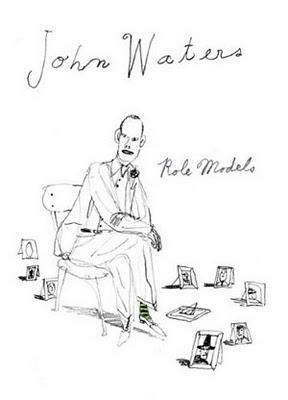 If that’s the reason you usually shop the autobiography and memoir section of the bookstore, steer clear of controversial filmmaker (Hairspray, Cecil B. Demented) John Waters’ new “memoir” Role Models. While disclosing inspiration is no problem for the eclectic Waters, laying his guts out on the table is not his strong suit. Of course, memoir can also be an account of someone else’s life as observed by the author–and in this case, we’re talking about the lives of famous crooners, a notorious killer, and fringe pornographers, to name a few. But if you’re looking for major insight into why John Waters is simultaneously comfortable with labels like “King of Puke,” “Duke of Dirt” and maker of “trash epics,” but doesn’t want to end up a gay cliché–as he confesses one of his heroes Tennessee Williams avoided becoming, you won’t find it here. You won’t find much of anything personal in this book. As Waters warns, “The ultimate level of celebrity accomplishment is convincing the press and public that they know everything about your personal life without really revealing anything.” And speaking of Tennessee Williams: his chapter begins “Tennessee Williams saved my life.” From what? He never says. Waters alludes to conformity and cliché as terrible things to avoid in life; but you might find yourself longing for more depth from a lengthy and detailed confession about the psychic wounds of childhood after reading such a statement. It just isn’t there. In his Leslie Van Houten chapter, Waters confesses to the tragic event in his own life that inspired his used and reused face-pressed-against-the-windshield-of-a-car image. Beyond this small detail, you’d be hard-pressed to find much else worth discussing in film school or after a screening of Polyester, for instance, in this self-effacing work. Perhaps his most interesting observations are found in the "Leslie" chapter simply because there are no other humanizing portraits of this Manson family killer to be found: “Leslie inspired me too. Inspired me to believe that if you wait long enough and work hard enough on your damaged psyche, you can eventually come out of it with some kind of self-respect and mental health.” But again, the questions and not the answers to the Waters’ enigma resurface for the reader: why does Waters see his own sins as akin to those of a woman who stabbed another sixteen times with a knife in the lower back, as Van Houten did to Rosemary LaBianca in 1969? The "Leslie" chapter is the most compelling of the book, but Waters lingers too long on this subject and apologizes for the crime, saying he understands its severity, too many times. As this critic went over her notes after finishing the book, she discovered that she’d written more than two dozen question marks in its margins. This harks back to the point Waters made early on about causing people to think they know everything about him, when really he has shrewdly kept his secrets under wraps. For every insight into the real Waters the reader gets, there's at least one question about said reality that naturally follows. Role Models is an interesting read, but it’s never as shocking or grotesque as any one of Waters’ films. And its message is muddled: do perverts exist because of or in spite of public opinion? Waters’ seems to teeter back and forth between wanting to vindicate his socially rejected role models and wanting to celebrate their freak status. One thing is for sure: reading this book is like turning over a rock in the mud and examining all of the creepy-crawlies you’d find there. Do it for the fun of learning something new, even though you’ll learn very little about cult filmmaker John Waters.